BKLYN YARD has been a very happening spot this summer, but like a lot of places, it's closing for the winter too. To celebrate the end of Summer 2009, they've decided to bring the fair into town. Did someone say stilt walkers? 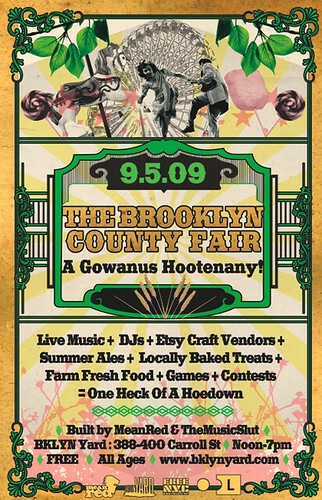 This Saturday from noon to nine, BKLYN YARD will be hosting A Gowanus Hootenany, but this isn't just any county fair. Instead of corn dogs and soda, we've got huaraches, bratwursts, and Van Leeuwen ice cream. And there won't be a pig race, but you can win unlimited drinks at the bar with your windowsill produce. All while watching a fire swallower or doing a jelly bean count. After you're done gorging, laughing, and dancing, they'll even let you watch a movie. Of course, this is free to get into. Noon: Doors open, spectacle begins! 3pm Most Delicious Fire-Escape Produce contest. Bring your best window-box tomatoes, your rooftop-raised squash, or any other I-live-in-a-tiny-apartment-but-I'm-still-a-farmer edibles. Best tasting entry wins unlimited drinks at the bar for the rest of the day! 7pm Free screening of O Brother, Where Art Thou? brought to you by L Magazine! For a full rundown, click here. We'll also be there with our cupcakes and other sweets- you should come down!